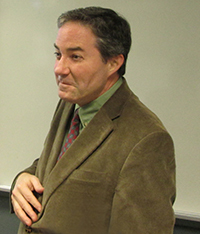 Professor Morey has been on the Emory faculty since 1994 and has been a member of the core faculty in Linguisticssince 2002. He regularly teaches courses on Old and Middle English language and literature (including Beowulf) as wellas the history of the English language. He also teaches other English literature courses at the undergraduate andgraduate levels. Professor Morey's interest in language and linguistics is focused on historical linguistics (what a previous generation called Philology), language change, and semantic evolution. He has additional interests in Icelandic language and literature and in versions of the Bible in the medieval European vernacular languages.